Imre Szakács is, in his own words, a ‘visual writer’. He is one of the most important artists in Hungary today making religious artworks. His visual language is very recognizable. He is known for his dramatic paintings with mysterious symbolism and surrealistic traits. I have known him since I was a child and the last time I visited Hungary I went to see Imre and his wife once again. They live in a self-designed and largely self-built house in the artists’ town of Szentendre, close to Budapest. The house reflects who they are: warm and inviting, strong and authentic, humble and genuine. One of Imre Szakács’ paintings, Mustard Seed from 2009, inspired Anna Jókai, the grand lady of Hungarian literature, to write her storyTogetherness. In her book she deals with what gives meaning to life, with solidarity and comfort, inspired by this painting. This made me curious about the work, hence I went to see the work at the house of its owner. It turned out she was about to create a special space for this painting in her new house! We walked to her living room and there it was… Mustard Seed. What happens when you are confronted with a painting that is so loaded with meaning? It makes you stop in your tracks and look carefully. The image takes hold of you, makes the world stand still. And then music starts to play in your soul as the strings of your own story are being touched. The artist’s experience of life, imaginative force and skill come to life, divine inspiration does its work and awakens what lies hidden deep within you. Your deepest longings for the fullness of life are aroused by a hopeful promise breaking through in an often painful reality. In the image unfulfilled longings are released and fulfilled. That’s how I stand before this painting, a light and elegant creation, painted with great technical skill. I look through a window of stone-like cool colours. Behind it I sense a warm light, which glistens here and there through the seemingly hard window frame. I see young slender branches waving back and forth. Mustard Seed, I remind myself. A wave of inspiration washes over me. A kind of whirlwind, windpipe or pillar of fire descends in the centre of the canvas. It breaks the static window open. Life radiates from it. Light is breathed out over the earth. The seed sprouts and grows into branches interlaced with light. Out of and into the light grow these branches, nourished by the same source, nurtured by life-giving vertical and horizontal relationships. That’s how huge a tiny seed with a little light and water can become. The image seems organic. It lives, moves, blows and bathes in the red-orange-yellow-golden light. It almost looks like a human lung with blood and air streaming through it, bringing life to the remotest places. I look up close and see birds and a nest in the branches. The mustard seed has matured and now gives room to other life. And somewhere in the middle of the branches, in the pillar of light, I think I perceive a face. For a child has been born – for us! 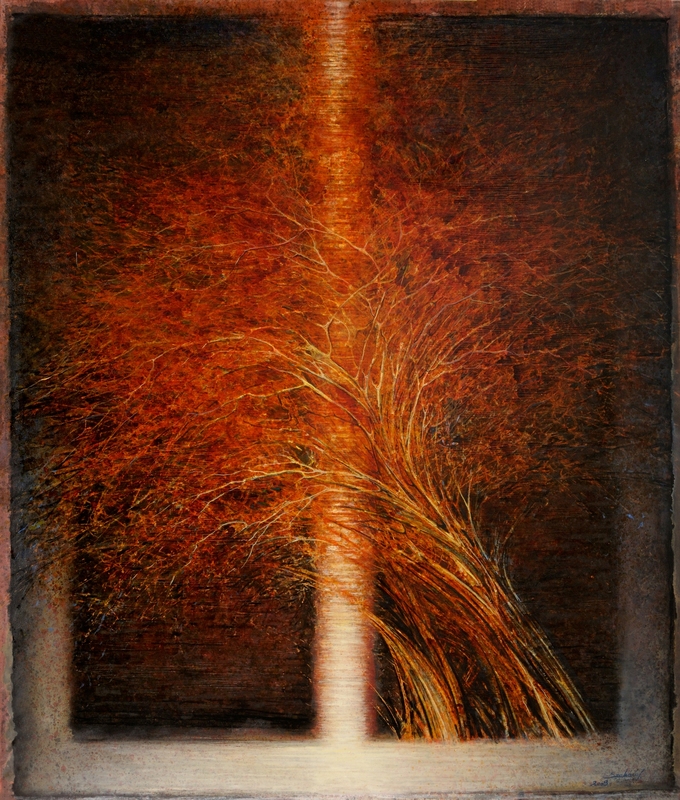 Imre Szakács: Mustard Seed (Matthew 13:31), 2009, mixed media on canvas; 150x130 cm. Private collection Budapest. Anikó Ouweneel-Tóth is a cultural historian and art consultant. She studied English Literature and Linguistics and Finnish Culture and Language in Budapest, Hungary. Later she studied Cultural Heritage at the University of Utrecht in The Netherlands. She took part in the international project ‘Converting Sacred Spaces’ which was commissioned by the Museum Catharijneconvent in Utrecht. At the moment she is interim chairman of the Art and Culture section of the CNV (National Christian Labour Union). In her work she focuses on contemporary art and artists. It is her passion to create incubators and platforms in which art and inspiration for life reinforce each other.